The latest Nintendo consoles showed us that few key titles can reverse the destiny of the console (DS and 3DS). It's too early to declare the WiiU already dead or it'll do sub-GameCube numbers in LTD. While that is true in theory, the DS and 3DS were not tracking nearly as badly as the WiiU is right now. Plus, the revivals in the handheld realm were much different landscapes when considering that third parties wanting to push handhelds didn't really have great alternatives (well, at least before the PSP hit its stride in Japan at least, and we all know about the Vita). With the WiiU, third parties can find other alternatives which seem to be paying off a lot better in the short term. With this in mind, the DS and 3DS at least got non-Nintendo support to somewhat sustain themselves while Nintendo got its ducks in a row, and this does not seem to be the case with the WiiU at the moment. Look at historic sales of Nintendo handhelds and then look at historic sales of their consoles. Wii U is dead. 3DS just needed a helping hand. It was practically guaranteed to bounce back. That's pretty much Iwata's argument on the underperformance of the Wii U's sales. And it's a horribly one since they're basically just hoping lightening can strike more than once instead of just changing the way they do business and adapt to the current environment. 3DS has weak competition in the name of Vita. Wii ah has strong competition in the form of PS4 and Xbox One. It's even having a tough time competing with PS3/360. The situations couldn't be any more different. Not comparable at all. A look at the GameCube should give you an better idea of where Wii U might end up. Horrible ? Every year of Iwata staying CEO puts as closer to happy Nintendo 3rd party future. Only just seen that 3DS figure. I thought everyone said handhelds were dead? That's an amazing figure for a handheld that was deemed pretty much DOA. 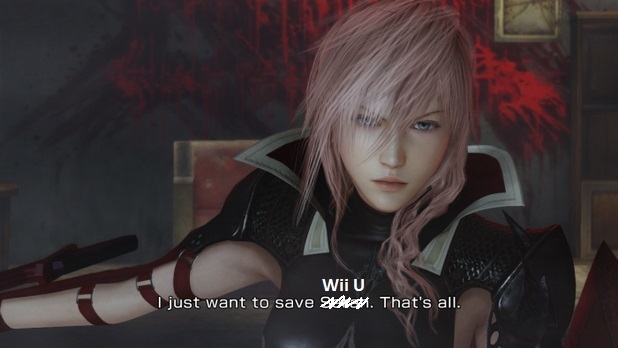 If only Nintendo could turn around the Wii U in the same fashion. 3DS has had a string of fantastic releases this year though. A Nintendo third party future is not a happy one. They can barely support their own consoles. I do hope Super Mario 3D World turns out well. As I've said before the bigger concern here isn't third party sales but first party games not selling. That's largely because I feel they aren't even bothering to market the game and not even doing a good of pitching them to those that already have the system. Super Mario 3D World is a game it seems they are advertising, at least on kids channels in the US. So perhaps they will help. If it does then I hope Nintendo has something else planned to pitch games like X, Fire Emblem, and Bayonetta 2. These are going to be the important "core gamer" games going forward and Nintendo needs to sell them to those that bought the system already and those that pick it up due to Super Mario 3D World. That's going to require some tricky marketing both to the masses at large and via Nintendo Directs. Even if 3D World doesn't do great they still have to do it though. We don't know what the budgets are like but they can't keep having their games sell so little. It's a very nice number, but it comes courtesy of new hardware and a huge, system-selling game. Let's not declare the return of the handheld just yet. I think it's possible the 2DS can breathe some new life into the market, but it's way too early to say that. Lets see whether it can sustain sales for a while. And it's a horribly one since they're basically just hoping lightening can strike more than once. I thought everyone said handhelds were dead? In 2007 the NDS was selling 400-500K in non-Holiday months every month concurrent to the PSP selling 150-250K. And the GBA was still selling the occasional 100K+ month alongside them too. So I got a response from Nintendo's corporate office in Kyoto. If you remember, I originally asked them whether the "1.7 million Pokemon X / Y combined" stated in their press release referred to just NPD sales or if they included digital sales as well. I made the claim earlier that the 1.7 million was just from NPD and PR didn't have access to digital sales for whatever reason. I did that because, from the NPD numbers I looked at, it appeared that PR was just referring to physical sales. However, because it would be weird for Nintendo to not include digital sales (why brag about a smaller number? ), I wasn't sure and didn't confirm it at the time. The "1.7 million" figure referenced in the press release for Pokemon X + Y combined ONLY refers to physical retail sales from NPD. Since it's 100% confirmed from an official channel, the clarification can be placed in the OP. If you remember, I originally asked them whether the "1.7 million Pokemon X / Y combined" stated in their press release referred to just NPD sales or if they included digital as well. I made the claim that the 1.7 million was just from NPD and PR didn't have access to digital sales for whatever reason. I did that because, from the NPD numbers I looked at, it appeared that PR was just referring to physical sales. However, because it would be weird for Nintendo to not include digital sales (why brag about a smaller number? ), I wasn't sure and didn't confirm it at the time. The "1.7 million figure" referenced in the press release for Pokemon X + Y combined ONLY refers to physical retail sales from NPD. Very nice for Pokemon 1.7m retail only. What's the NPD LTD on WiiU? Between 1.39 and 1.40 million as of October 2013. ...so awesome, indeed. But you know how more awesome would you be? The Wii U's LTD is 1.4 million in the US. Sony says they sold 1 million PS4s on 11/15 (in NA, not just US). November's NPD tracking period includes Black Friday (ends on 11/30, coinciding with the calendar month end for once). The PS4 has a chance of overtaking the Wii U in its first month of NPD tracking, depending on supply and how the Wii U does in November. If not, it'll certainly overtake in December. Meanwhile, the 360 has a chance to pass the Wii, if its sales can stay close to last year's Nov/Dec, and again, depending on how the Wii does. My figures say it will fall 3,000 units short, and have to wait until January to take that lead. November and December are going to be fun if the data's not too locked down. I expect at least 1.6 million from November NPD (equivalent to November sales for the DS when it was at its peak). Wii U is at 1.4 million. If it flops in November and only manages like 200K consoles, it's very possible that the PS4 could surpass Wii U within its very first reporting month (2 weeks of sales). It certainly is a very exciting time for Sony in terms of the Western market. PS4 is going to obliterate Wii U this holiday season. Sony estimated 3 million units sold by the end of the year (worldwide?). There's no way they could have predicted that incredible 1 million in 24 hours number, so I think they'll be way over 3 million by January, assuming they have the stock ready. I guess that's what happens when you blow a 1 year head start, Nintendo. They predicted it by shipping it. The only surprise for Sony would be them not selling the million. That's a lot of units to have ready by year's end. Well it could have taken a week, but yeah, they seemed to be very confident on having millions of preorders so it's not surprising. WW Sales could easily be 2.5million at the end of November. Well it was a million preorders worldwide. I'm sure that NA preorders were quite a large portion of the pie, but it wasn't the whole thing so it seems to suggest that there were quite a few in store pickups on launch day. That's still impressive day 1 sales any way we slice it. I could see PS4 obliterating Wii U's LTD sales by the end of 2013. I had read millions but may have been dodgy translation of a 4gamer article. I think it's pretty clear at this point that Sony will sell as many units as they're able to ship in North America this year. The only thing that will keep the PS4 from overtaking total Wii U sales is the output of their factories and the speed of their shipments. Right over 3 million sold during the holidays, worldwide. Then January happened, and February...and March-October. Super Mario 3D World is now currently ranked #1 on Amazon.com, and that's with it's low U.S. install base, and all the PS4/Xbox One games released/soon-to-be releasing. They shipped that many. The distinction does matter early in a system's life cycle.